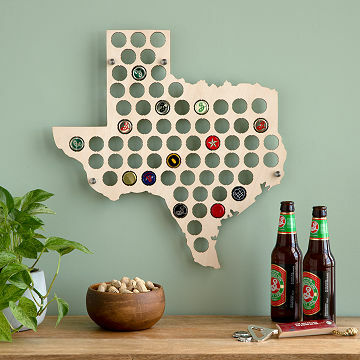 These birch plywood, state-shaped display boards are handsome holders for your bottle cap collection. Click here to see all available Beer Cap Map States. Pair your Beer Cap State with our Dent Free Bottle Cap Opener. Love this. We are going to put at our place at the lake. Unique item that most people have never seen. This was the perfect gift to surprise my husband with because he loves beer. We just moved to a new state and we enjoy drinking new beer. He loves it and it didn't cost a fortune! Great gift that bridges the gap from home state to new state of living and displays sharing cheers with those whom visit sharing memories , cheers, tears and years blessings ! Although the idea is great and we maybe able to reinforce them somehow, they were extremely fragile. Its a great gift for those that love unique pieces that can hold a thousand stories. Each bottle cap placed in it holds its own story and shares your experiences with your guests as it's filled. My friend's husband loved being able to display his bottle caps in a unique and collected way. Ended up on the wall in his man cave. Currently hangs on the wall in our kitchen. I bought this as a gift for my boyfriends brother. Everyone liked it and thought it was a thoughtful gift. My only complaint is the wood wasn't quite as nice as I would have liked it to be, but it was still pretty sturdy for the price. I would definitely purchase this again as a gift for someone else. Aesthetically pleasing and lightweight. Material was thinner and less sturdy than I had anticipated, but a great product nonetheless. The product looks well made. I can't wait to give it as a gift and see how it looks with the bottle caps in it. This was purchased for the man cave in my son's new home. It is well made, unique, and my son loved it. The wooden plaque included hardware to securely hang it.